Most of the time, I don’t choose the recipes I share here, it’s the market that controls it. As it happens when you live in a climate that deprives you of field-fresh produce for almost half the year, leaving you to go completely out of control and of course overdo it in the months that you’re graced with it — bringing home buckets of fresh produce when you only need a fraction of it. The other day I picked-up some mega-huge red peppers thinking about pickling them, but then I changed my mind — as I often do— and I instead roasted them. If there’s one thing I like to turn my oven on, is to roast my peppers. I prefer this over blistering them on the stove, which makes them easy to peel but not tender and sweetly cooked as they get in the oven. After peeling their skin and cutting them into thin strips, I toss them with garlic, olive oil, oregano, salt, pepper, and red wine vinegar which punches up their flavor a bit. To be honest, I’ve been making these for years and have them ready at all times to use. I like to put them into canning jars and they last for a very long time in the refrigerator, that is of course if you don’t eat them too quickly. 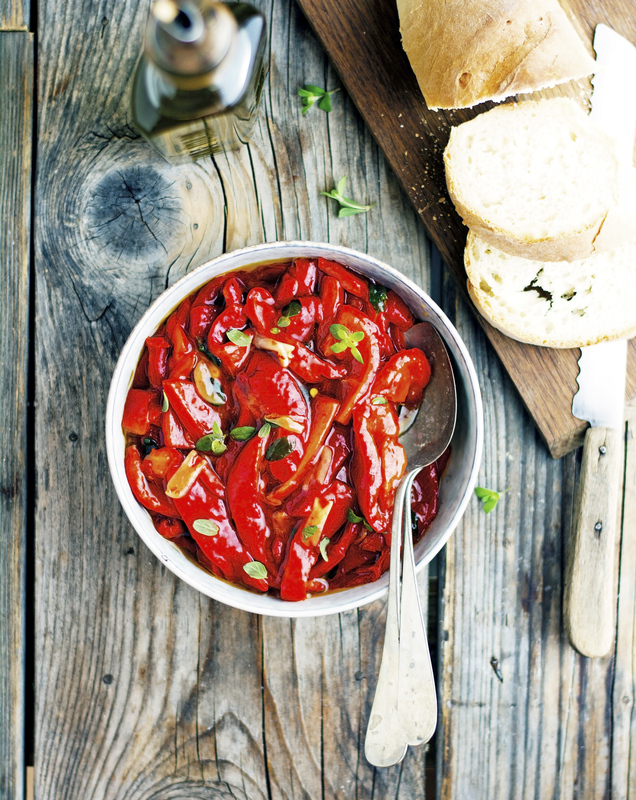 Peppers marinated in a mixture of garlic, olive oil, herbs, and vinegar. That easy. A very excellent flavor combination but the roasted peppers are truly the highlight of this dish. What is so excellent about this recipe is it can be used in a lot of different ways. On salads, pasta, bread and just by itself. I personally like to serve these over toasted slices of bread with a smear cream cheese (or better yet goat cheese) — so yummy, you need to try it for yourself! 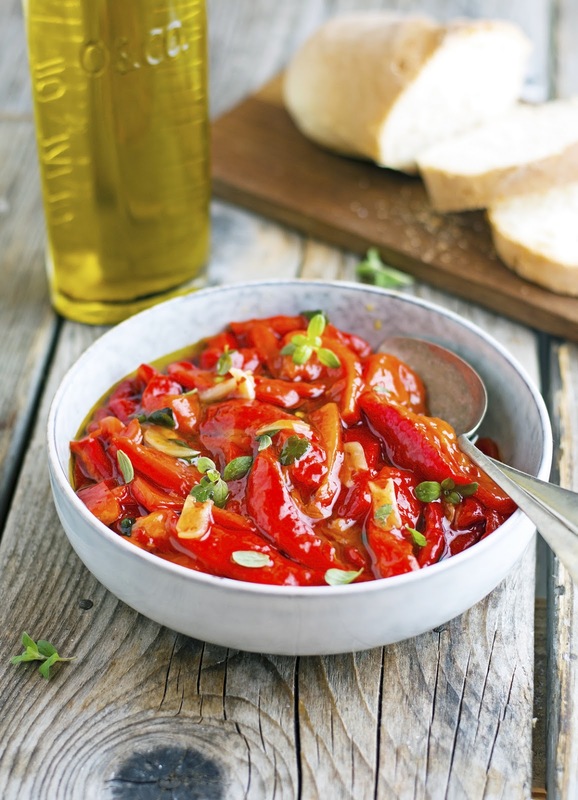 Marinated Red Peppers with Garlic and Oregano Print this recipe! Heat broiler. Place bell pepper on a rimmed baking sheet. Immediately transfer bell peppers to a large bowl (preferably glass or ceramic) and cover tightly with plastic wrap. Let sweat for 15 to 20 minutes (this is very important, it will make the peppers more tender and easier to peel). Remove skins from peppers — I do this by using paper towels, the skin comes off easily — and remove seeds. Slice peppers into about 2-inch wide strips and transfer to a bowl. Add garlic, olive oil, vinegar, and 1 tablespoon of oregano. Toss until combined then season with salt. Cover and let sit for at least 20 minutes. Just before serving, take a taste and adjust salt and/or vinegar if needed. Scatter remaining tablespoon of oregano on top and serve. One serving yields 100 calories, 7 grams of fat, 8 grams of carbs, and 1 gram of protein. 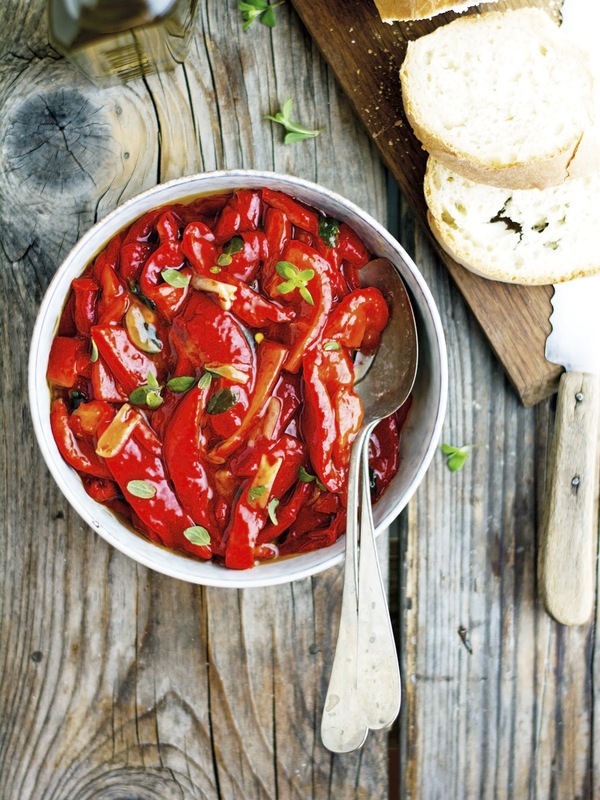 Can't wait to try making this homemade version of roasted red peppers! !